so you may remember that a few days (or maybe weeks) ago I mentioned an upcoming giveaway… well the time has come! The wonderful people at CSN Stores & Cookware.com have sent me this great Emerilware Cast-Iron Enamel Deep Dish Baker to test drive, AND they are going to also send one to one of my very lucky readers!! Sunday night my sweet man, the savory gourmet of the casa, decided to take our new pan for it’s inaugural test-drive, by making his version of Julia’s Gratin Dauphinois. Now that the potatoes are cooked through it is time to take the dish from the stove top to the oven broiler to melt the cheese and herb butter topping. All done and ready to eat, so warm and yummy and perfectly cooked! I will announce the winners on Jan 21! i love the size of that pan too. AMAZING! Now that is an awesome dish. Me likey. I really like that pan! I have been wanting something that can go from stovetop to oven! your man is doing some fine cooking! I never thought to cook on 2 burners/1 pan! I'm going to try it..
Oooooh! What an awesome giveaway!! What a great giveaway Jerusalem. I stumbled across your blog a little while ago. A link from a link from a link… Lucky for me. Sometimes I wonder what if the world was one big snow globe and we could gently shake it up so that kindred spirits could find each other. Maybe the internet is like that. Thanks for your generosity with this giveaway! Oh how lucky you are to get to test drive this!! I LOVE IT! I am thinking of redoing my pots and pans with cast iron. This would fit soooo nice!! I'm off to face book, tweet and post!! I'll let you know when I do! THANKS for offering. I do love cast iron!! 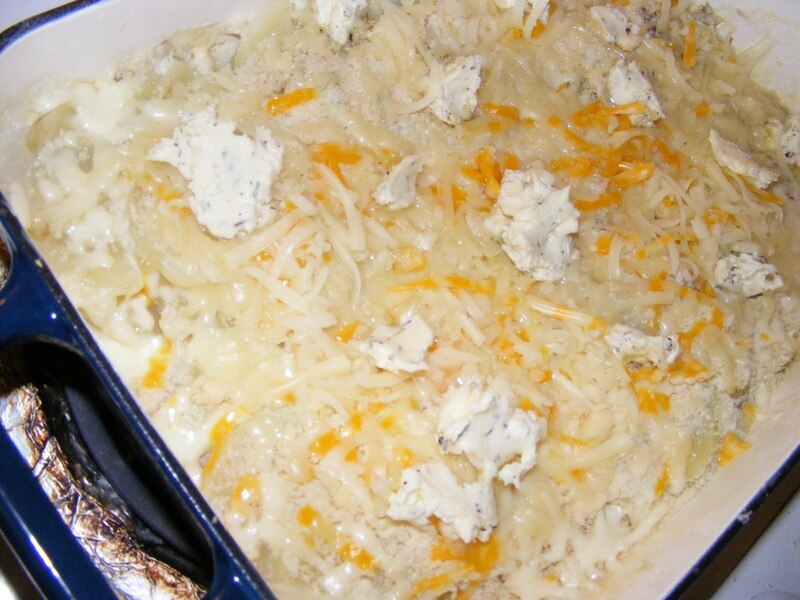 I have two Au gratin pans and LOVE them!! Oooh! That pan looks so snappy…not as great as those potatoes though! YUM! I want this one so bad! Thanks for the giveaway.. and those potatoes look so yummy! Oh my goodness that looks so delish! 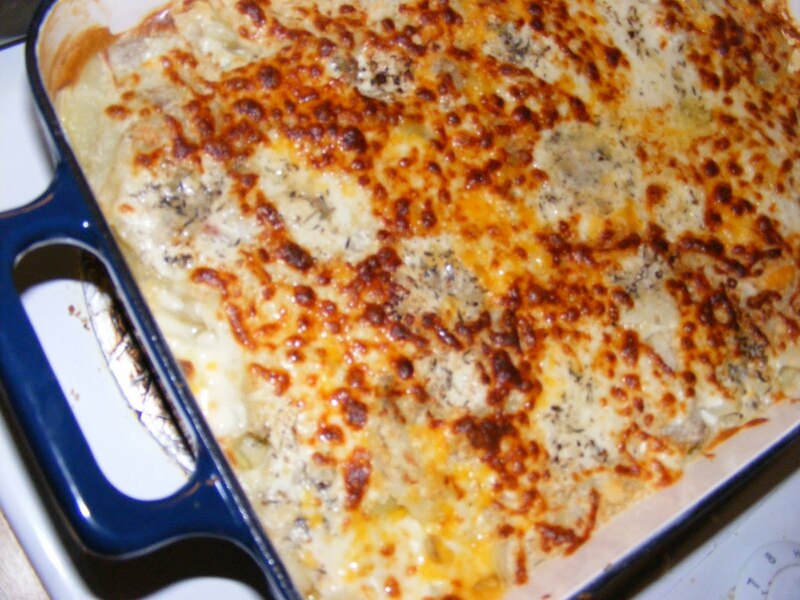 I'm drooling… potatoes and cheese heaven! I blogged (http://mesomedays.blogspot.com/2010/01/very-cute-blog-and-giveaway-of-great.html) and FBed it. If I win, tell your man to send me a copy of that recipe! wow.. what great looking dishes and dish!! i sure could use this!! happy cooking!! This is JB's mom – I FB'd your link. Looks like I would like the pan a lot!!!! I must win this pan!! 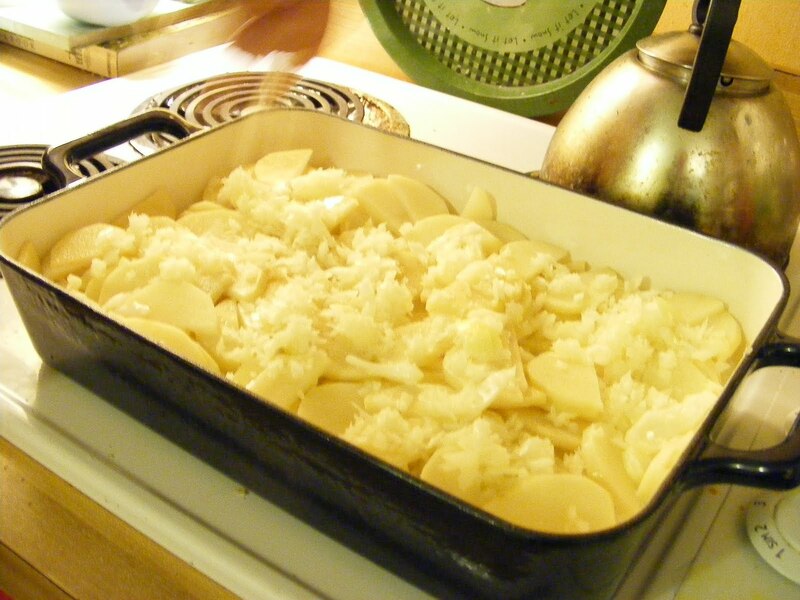 I love it and will make potatoes all the time, plus a whole lotta other delcious dishes. This looks like an amazing pan, and what is in it looks delicious! I'm drooling over them both! Can I just say I wish someone had told me that pyrex would explode if you took it from cook top to oven? Cause I found out the very hard way. The kind of hard way that leaves a glassy green bean mess in the oven. And, Sara Beth tweeted, I'm proof! If I win can you please fill the pan with those yummy looking potatoes??? Great giveaway! This pan looks awesome! Omigosh, that looks so good! I need a little Julia style at my home, too! Jerusalem, I already had you listed as one of my “good reads” on my blog, http://www.coffee24tea.blogspot.com but I just linked your post on my blog. Sure would LOVE to win this pan and thanks for informing us about this product! My husband made Julia's Coq Au Vin this weekend. Put our guys together and you get one delicious meal! I also put a link on my Facebook page! So…I cannot even tell you how much I miss my moms potatoes! She moved to Ohio (I live in So Cal) a little over a year ago and each visit to her house, the potatoes somehow get skipped. So, I would LOVE not only to have this pan but to try this yummy looking recipe!!!! ooooh, great pan,and the potatoes look pretty fantastic too! I posted the giveaway on my blog. Beautiful!! Add me in!! I would love to win one of these! So much you could do with that baby! Wow, my husband would love that pan! This would make a great Valentine's present! i love enameled cast iron! that pan looks great! gorgeous pan! anything cooked in that has got to be delicious! Wow, how fun to possibly WIN this dish! (Well, not the food inthe dish!) I use my cast iron skillet daily, but have any cast-iron enamel cookware! I would absolutely LOVE to try this! Thanks for the chance to win! I love these pans!!! I'm going to link it to facebook too! Thanks for the chance to win!!! My Mom bought me a cast iron skillet when I got married and it has been my go to item in my kitchen for the last 7 years! Cast iron cookware are heirloom items, they last forever! I am so so so excited about this pan! I might have to buy one if I don't win. I would SO love this! But I never win anything!! Maybe 2010 will be lucky for me! My pan I have right now is NASTY looking. It's clean but so old that it really should be replaced! This one is BEAUTIFUL! This giveaway is a winner! I love this type of enameled dish, they are so easy to clean up! Sounds wonderful! LOL at being able to use it as a door stop. Hmmm…might just have to add Lark Rise to Candleford to my netflix. Sounds interesting! As for sofas, you might check to see if you have a JC Penney outlet within a 100 miles of you. I bought their slipcovered Friday sofa for a mere $199.00! Granted I don't know how often they get them in, but it's worth checking on. I so love this pan! Perfect color too! Thanks for a great giveaway. That looks like a great pan! thanks for the chance to win it! I love cast iron. I like the way the heat is conducted through the pan so there's no hot spots. great little pan there. Oh, I love cast iron enamel cookware! And that potato dish looks so yummy. that is awesome, I own some Emerilware and it is really nice stuff… I really like this pan, and boy does that potato dish look good! Yum. Oh yum!! Pick me, pick me. Pleeeeeeease!!?!?!!??!?!? Oh the dish is lovely and that food looks mouth watering. I'd love to win. Nice give away. Please enter my name in the drawing. Thanks. The dish looks fantastic! I would love to make something yummy in it!! OMG I've wanted one of these for years now! I hope I win! WOW! Would I love to win! Thanks. I have added you and your giveaway to my blog. I LOVE the pan and would love to have one! Please do enter me into this drawing–only way I will be getting one! Thanks so much for the chance! I have blogged about your giveaway and linked back to you! Great pan! Thanks for the chance! I think this is a great giveaway and sure looks like it would be great pan to add to my collection. I'm not sure I'd call it little at 10 lbs of weight though. Awesome give away!! 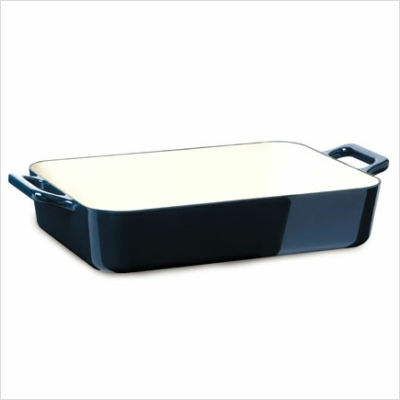 Please throw my name into you give away pan…love to win it!! Thank you for the chance! 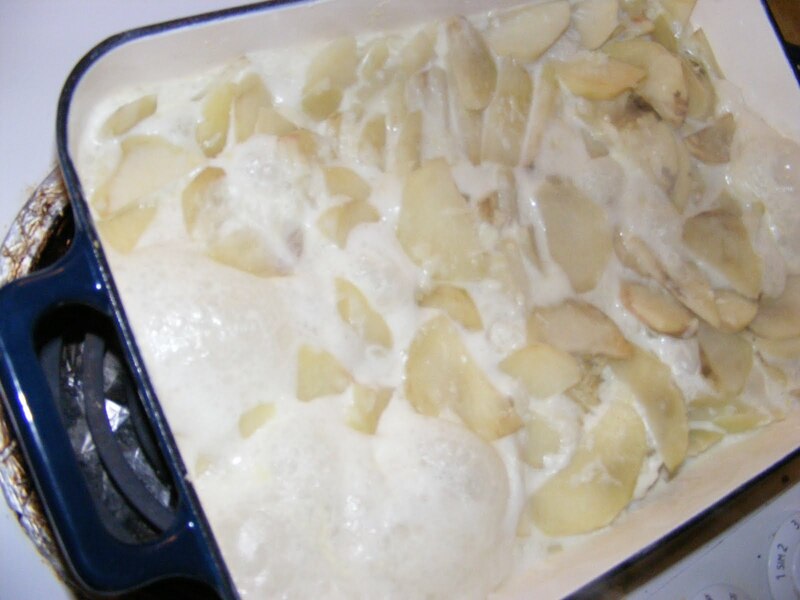 The potato dish looks divine! I'd love to be entered into your generous giveaway! What a great looking pan !!! Would love to try one. WOW….I love that pan!! Please enter me!! i don't suppose this is open to uk readers ??!! I absolutely LOVE cast iron enamel bakeware. It cleans up so easily. My sister, Diane (see above) sent me over…just in time…please add my name to your giveaway…that pan is awesome! Yes. Yes. Yes. I want that pan! Yes, I just broke my glass cake pan, I NEED that pan! Looks great!! I would love that pan!! Please pic me!!!!! I love it too! I received a similar pot (a 7 quart Dutch oven) from my mother-in-law for Christmas. It is a Martha Stewart for Macy's and I LOVE IT!! Congratulations to whoever wins. Thanks for sharing! I'd just love that pan. thanks for sharing! Hey, hey, hey = that is one awesome pan! Thanks for the opportunity! Sounds fab! Please sign me up! If not, I absolutely would LOVE to have that pan! We have just one that size and it always seems to be in the dishwasher or filled with food when I need it!